Everyone has a different priority when it comes to purchasing work footwear. There’s the “saver” who’s looking for a deal, the “cowboy” interested in the right look, the Haz-Mat guy looking for special work boots that meet work requirements, and many more. All customers will find what they’re looking for with Working Person’s Store. If you’re an “investor” searching not just for men’s and women’s boots of the highest quality, but also a pair that can be repaired and last so long that they feel more like a part of the family than just work footwear, then let us introduce you to Danner Boots company. This company was built on investment, and it continues to build investments for all footwear needs of working people. Started in 1932 in Chippewa Falls, Wisconsin, Charles Danner took a big risk pursuing his passion for high-quality, handcrafted work boots during the height of the Great Depression. In 1936, he moved his business to Portland, Oregon, where he forged a reputation for the toughest logging boots in the Pacific Northwest. 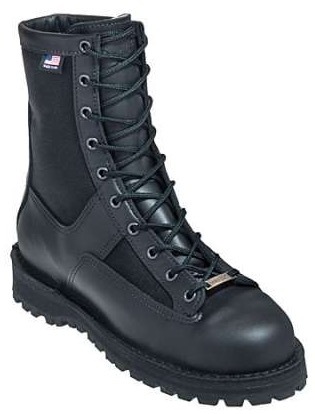 As the American economy recovered and diversified, so did Danner, adding lines to their traditional American-made boots to also service the hiking, military, law enforcement, and hunting industries with domestic and imported styles. Many changes have been made by the Danner in the past 83 years, including acquiring LaCrosse Footwear in 1994, (which brought the Danner company back to Wisconsin). However, through the years, one thing has not – and will not – change about this company: quality. Purchasing Danner shoes and boots is a long-term investment you can count on year after year. Many work styles are designed to be rebuilt by Danner’s expert craftsmen for long-term use. You can’t say that about any ol’ pair of work boots. Loggers, linemen, hikers, and hunters will find out why Danner tops the list of quality work shoes for all needs. Find your next pair at Working Person’s Store!